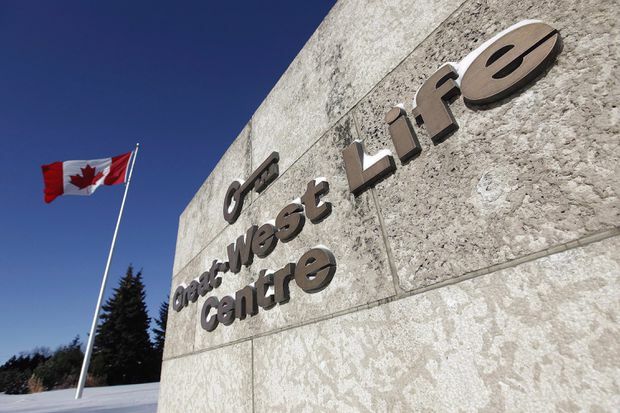 The Great-West Life headquarters is pictured in Winnipeg on Feb. 19, 2013. Great-West Lifeco Inc. raised its dividend as it reported a fourth-quarter profit of $710-million, but fell short of expectations. The life insurer will now pay a quarterly dividend of 41.3 cents a share, up from 38.9 cents. The increased payment to shareholders came as Great-West reported its profit amounted to 72 cents a share for the quarter ended Dec. 31. That compared with a profit of $392-million, or 40 cents a share, in the same quarter a year earlier when the company took a $342-million charge related to U.S. tax changes, the disposal of an investment and restructuring costs. During its latest quarter, the Winnipeg-based insurer saw strong performance from its European arm, but weaker contributions from its Canadian and U.S. divisions. Great-West chief executive Paul Mahon said Thursday he was pleased with the company’s performance in 2018 over all, as it saw growth across its segments. On an adjusted basis, Great-West says it earned 72 cents a share for its most recent quarter compared with a profit of 74 cents per share a year ago. “GWO’s in-line quarter was primarily a reflection of a low tax rate offsetting weak business segment performance,” said Gabriel Dechaine, an analyst with National Bank of Canada, Financial Markets, in a note to clients. In Europe, Great West reported adjusted net earnings of $349-million during the quarter, up 13 per cent from $308-million a year earlier. It said this increase was primarily driven by new business gains. However, its U.S. division reported adjusted net earnings for the fourth quarter of US$41-million, down nearly 32 per cent from US$60-million a year earlier primarily owing to the impact of equity market declines. At home, the insurer’s Canadian segment reported net earnings of $310-million, down 8 per cent from $338-million during the fourth quarter of 2017. The decrease was primarily owing to higher business and strategic expenses and the impact of equity market declines, it said. The expense growth is “disappointing,” as a $216-million restructuring charge during the second quarter last year was expected to curb cost growth, Mr. Dechaine said. For the 12 months ended Dec. 31, the Winnipeg-based insurer earned $2.96-billion, up from $2.149-billion in 2017. That amounted to $3 in earnings per common share, compared with $2.17 in 2017 and slightly below the $3.02 earnings per share expected by analysts. Great-West’s latest results come after it signed a deal to sell its U.S. individual life insurance and annuity business to a subsidiary of Protective Life Corp. for $1.6-billion.